Can't believe how quickly the month has flown by! A few new updates for the start of April. Welcome to our newest buyer - SAU 60 Fall Mountain Regional School District! We are excited to be serving you and your students. Welcome to our newest grower - Farmer John's Plot in Dublin - who has some delicious salad greens available! Following on last weeks, we continue to have some great specials: Grafton's garlic cheddar cheese, Green Mountain Orchards honeycrisps, and red-gold potatoes from Harlow Farm! We also have eggs and lamb sausage from Edgefield Farm and an abundance of chard, kale, and fresh herbs from Duttons. Currently available: apples, carrots, cabbage, celeriac, chard, kale, potatoes, rutabagas, salad greens, turnips, herbs, and more! We also have delicious bread, bagels, yogurt, pudding, cheese, eggs, maple syrup, granola, sauces and local meat. 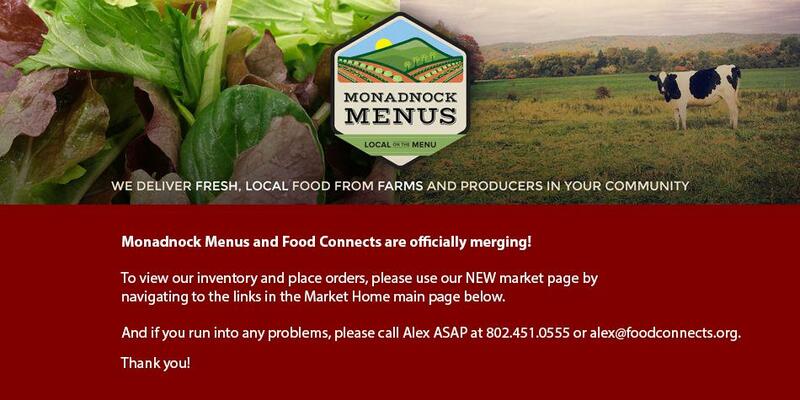 Monadnock Menus now has our very own MM facebook page Please visit and "like" us to help spread the word. If you would like to be able to share your organization's facebook posts please let me know and we can add you as an editor. April Harvest of the Month is Dry Beans! Check out the website for some great recipes and free educational materials for your cafeteria or shop. I can attest personally to the deliciousness of the chickpea cookies! Farmer John's Plot is a nonprofit working farm that models and promotes sustainable food networks and responsible land stewardship, providing dynamic connections to fresh, local nourishment for everyone. We grow a wide variety of non-certified organic produce (all organic practices, just not certified), organic pasture raised eggs, pasture raised heritage turkeys and much more! We farm on land leases of over 100 acres in Dublin, NH. We market our products through our self serve farm stand which is open daily at 26 Chesham road in Dublin, our CSA and area schools and businesses. Unwashed, end of season small russet potatoes. These potatoes are still great, but much smaller than normal.